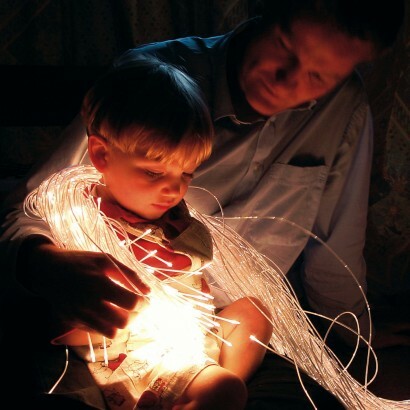 Our Sensory Fibre Optic kits consist of an LED power source featuring multiple operation modes including static or colour change with a choice of three speeds, so you can change the effect to provide exciting visual stimulation, or create a profound calming effect, ideal for adults or children with anxiety or sleep disorders. 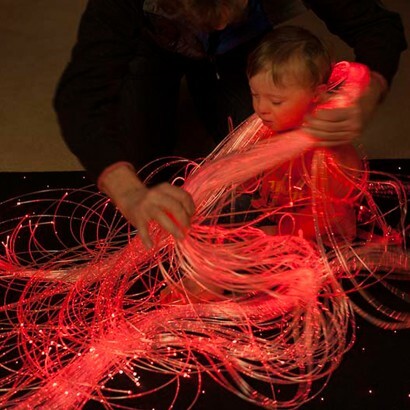 The fibre optic strands are completely safe to the touch due to no electricity travelling down the fibres themselves, the strands only carry light. The polymer fibres in a clear sleeve, which is cracked so as to leak out light all down the length, rather than just the tip of the fibre optic, giving a wonderful magical sparkly effect. The PVC in these harnesses is phthalate free and the harnesses themselves have CPSIA and EN71 toy certifications so you can be sure you are purchasing a safe, high quality, UK made product. There are two kits available in either 1m or 2m length fibre optic tails. 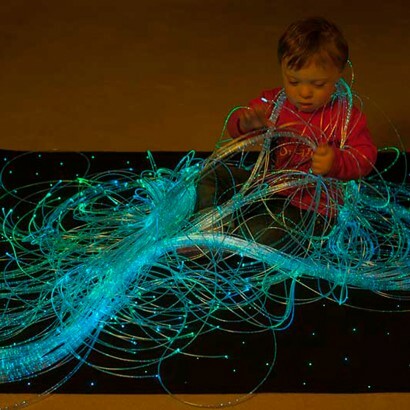 Microled1000 comes with 100 tails measuring 1 metre long, and powered by a seven colour lightsource which is controlled by two buttons on the rear of the lamp. Microled4000 comes with 100 tails measuring 2 metres long and is powered by the same seven colour lightsource but also comes with a touch sensitive remote control which allows you to pick the exact colour output you require. It also offers you a range of colour cycling options at a choice of speeds. 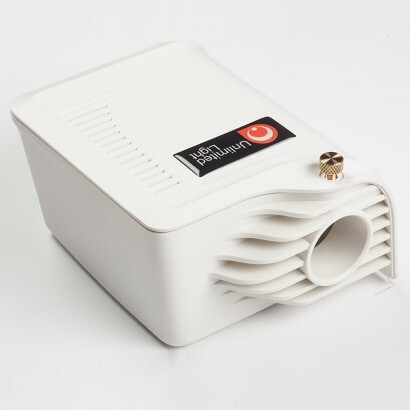 This LED light source offers complete two-button control over light output, with the ability to stop on the four main colours (white, red, green and blue). It also allows colour cycling at a choice of three speeds through six colours; red, yellow, green, cyan, blue and violet or through the range of seven colours; red, yellow, green, cyan, blue, violet and white. Manufactured from durable ABS. 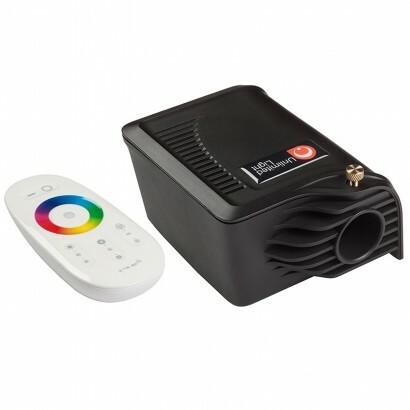 The MicroLED4000 kit is controlled by an advanced RF remote control which features a multi-colour touch wheel allowing you to instantly switch to almost any colour imaginable. The light source remote control also gives the ability to start and stop colour cycling on any colour. It also features in-built synchronisation with the ability to control more than one unit with the same remote control. 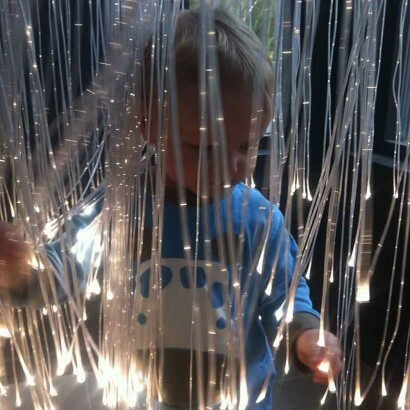 I have this lighting kit for my daughter and she loves it, the fibres are quite stiff so no danger of them getting wrapped around anything or accidentally tying together, they don't get hot and the light is kept away from my child and is robust enough to take the odd knock. my daughter uses this both to play with and as a night light, i have hung it up on the wall using a bungee cord and some hooks and it makes a great display for her. well built and sturdy product, great quality. Glow were a delight to deal with, can't recommend highly enough!